This morning a friend told me it was a magic day. It had to do with the fact that it’s Bell Canada’s *Let’s Talk* Day in support of mental health. The friend has mental health issues and deals with them heroically; fortunately, he’s able to. Many would choose to but can’t. Most recently he’s been working at spreading the word about today, encouraging people: friends, family, colleagues, neighbours, passersby on the street—to make a call or tweet for the cause. That was the first magic, this excitement wrapped in hope that maybe the word is getting out there, that one day mental health issues will NOT be something to brush under carpets. There should be no stigma. There should be much more understanding and assistance. That’s the goal. But something about the idea of a magic day has resonated beyond the initial meaning. I have already danced and sung and hung laundry on the line. I’ve come across a beautiful post this morning and, another, discovered yesterday, I chose to read again because it’s relevant and it makes me happy. 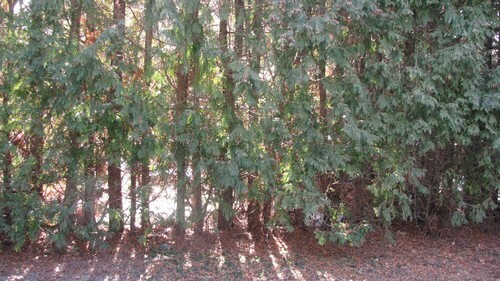 I watched a cardinal and a blue jay hunt and peck under the cedar hedge, peacefully and within a foot of each other. I began to think they might be a couple… or should be. A sign that disparate groups perhaps can get along? My friend’s spirit and determination, and the courage of anyone dealing with the challenges of mental health—yet still finding pleasure in small things—reminds me how much there is to be grateful for. I’m counting my magics today and will list them on Matilda as the day goes on. Hoping you’ll count yours also! Thanks, Sheree. It’s been a sweet day. Your orchid was a lovely beginning. It felt magic to walk in the sunshine today. Another good magic moment was reading your post. Thanks. I particularly like the jay and the cardinal–such unlikely buddies–sharing space. Oh, how nice to know you’re walking in the sunshine! Must feel like a tiny miracle when you think back a few weeks.